The first thing you’ll always do when you come into the office is sign in. Whitney runs the front desk and she will greet you when you arrive. If no one’s there, please wait, someone will be right with you. Please bring your insurance card(s) because we will need to copy them for the information to file insurance. Next, we need you to fill out the admitting paperwork unless you have done so in advance. 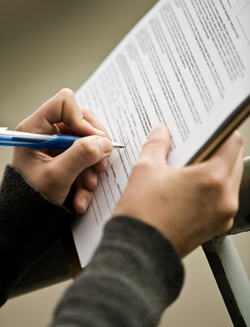 We ask that you try and be as thorough as possible in filling out the new patient information and sign where indicated. We are interested in learning about the problem that brought you to our office, any conditions for which you are currently taking medication, past surgeries and hospitalizations, past car accidents and traumas as well as your family, work, and social history. All this information helps Dr. Rickels assess your condition. After filling out the paperwork, Dr. Rickels will see you and discuss your problem with you. If Dr. Rickels believes she can help you she will accept you as a patient, if not she will refer you for other sources of care. Your first visit will take roughly an hour because Dr. Rickels will take a complete history and perform an orthopedic and chiropractic exam to help her understand your problem and document your condition. Chances are you will also need x-rays to see the exact condition of your spine or joints. Just as a picture paints a thousand words, an x-ray aids a Doctor of Chiropractic enormously in pin-pointing the area(s) of dysfunction in your spine or joints, while at the same time identifying potential contraindications to your care. Many want to try to save money and not incur the additional cost of an x-ray but don’t realize the x-ray typically pays for itself. By helping to pin-point your exact problem and eliminating guesswork, x-rays can save return visits down the road and maximize the results you get. On occasion, further advanced imagining may be needed such as an MRI. If so, our office will work with you to set up an appointment at a facility that suites your needs. After analyzing all the information Dr. Rickels has obtained pertaining to your problem she will discuss her findings and what she has determined to be causing your problem(s). She will also discuss her approach for your correction as well as answer any questions you may have. If you are comfortable with Dr. Rickels approach your care will start on your first visit. After completing your initial care you will check out at the front desk to complete the billing for your care and to schedule your next visit.